The ransomed of Yahweh shall return, and come with singing to Zion; and everlasting joy shall be on their heads. They shall obtain gladness and joy. Sorrow and sighing shall flee away. 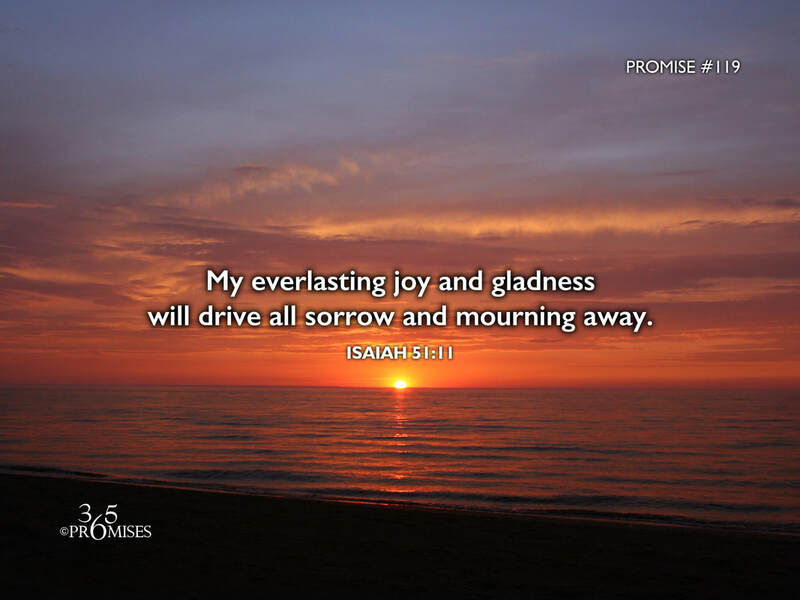 There is no question that the joy of the Lord is our inheritance and today's promise tells us that God's everlasting joy will be upon our heads! While we know the culmination of this promise will be in heaven, my prayer today is that we would experience a measure of the joy of the Lord here on earth. In Isaiah 61 we read that weeping lasts for the night, but joy comes in the morning! Hallelujah for that promise! Psalm 16:11 says... You make known to me the path of life;in your presence there is fullness of joy;at your right hand are pleasures forevermore. (ESV) There is no question in my mind that God is filled with joy and He wants us to be filled with joy too! May we all experience an increased outpouring of the joy of the Lord today, and may His joy drive all sorrow and mourning away!